The contents of the chest you just opened are the realization of an original yet markedly anachronous project, as hinted by the name it carries: Semetipsum. Wine, Sound and Image are its constituent elements; the interaction between different crafts the method chosen; Discipline, fidelity to one’s convictions and willingness to engage its inspiring principles. Such principles are shared by all those who participated in this enterprise, all woven together into a friendly web of spiritual consonance, vibrations and affinities. Semetipsum, as in “himself-itself”, is a free source of creativity, reaching out towards those finalities, to which we all naturally aspire - in so doing it enables the seed residing and fermenting in interiore homine to mature and come to fruition. During a serene late spring afternoon Musicians Eraldo Bernocchi and Harold Budd held a concert among the wine-filled barrels and kegs of Michele Satta’s wine cellar in Castagneto Carducci: as strings of sounds were reverberating off the geometry of the environment, sequences borne of improvisation yet seemingly guided by an unerring logic, the cellar and its contents became progressively more than a simple stage in the mind of the attending public, they became centrepiece of the event itself. 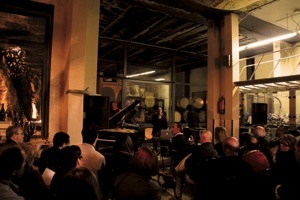 Without the presence and action exerted upon the event by the wine produced by Michele Satta, itself the fruit of a kind of labour, of a wisdom and of a tradition which require continuous adaptation and reinvention to maintain themselves meaningful, the music that afternoon might have been wholly different. Without the spirit embodied by and encrusted into the walls of that cellar, the public might have witnessed different notes and different rhythms. On that occasion this Wine’s character, a Sangiovese Vintage 2008, and both musicians’ temperament found a balanced meeting point thanks to the genius loci, both parties being truthful to their natural inclinations, yet able to learn from and govern that which fate and the immediate circumstances had in store for them. Semetipsum does not try to induce just anything to happen. It aims to depict how “exactly that thing does happen”. It does not simply represent the result of a superficial collaboration between different professional attitudes, but rather aims to embody the final stage of the development of a process of common, shared sensitivities. It has very little to do with results, which could be good or bad, but all to do with the quality of a method and the strength of an idea. “Do what you have to, let that what may, happen”. The intervention of the Artist Petulia Mattioli starts at a later stage when the wine has already embarked in its process of improvement, a period never shorter than two years following its bottling and highly dependent on the willpower (to delay the opening) of those who will be its final custodians, and when the music, hardly touched and edited since the recording, has already started to sediment and mature in the minds of both the musicians and the public.Wine and music become the main ingredients enabling images to take shape – by virtue of the principles underlying Semetipsum, the means of expression chosen by the Artist can be none other than that, which best allows her poetry to manifest itself: video. Inspired by 18th century German physicist Ernst Chladni, the Artist submitted the wine, held inside an open cylindrical container, to the vibrations generated by a connected sound diffuser playing the music recorded at the concert. She then filmed the shapes generated by the interaction between matter-wine and sound appearing on the surface of the liquid. Finally, she extracted a single frame from the reel, which became the label of the wine bottles, allowing one to nearly “see the sound”. We should be aware, though, that we are not witnessing a synaesthetic phenomenon - sensory experiences are not exchanged/interchanged, but rather mutually amplified; the image is there ultimately to be seen and not heard. The same applies both to the Sangiovese Wine and to the Music emanating from Harold Budd’s piano and Eraldo Bernocchi’s laptop: Music, visual arts and oenology work synchronously and reinforce each by remaining faithful to their original mission; rather than aiming for a superficial contamination, as so often observed in contemporary modes of expression, they have elected to be permeated by the spirit of that earth which has made Semetipsum possible. Marco Pierini (Siena 1966) he is Ph.D. in aesthetics at the Siena University. Since 2002 he directed the Siena's contemporary art center at Palazzo delle Papesse and from 2008 at Santa Maria della Scala, also known as SMS Contemporanea. Since june 2010 he's director of the Modena's Civic Gallery. He published several essays on arts, aesthetics and music, among them: Jaume Plensa. Fiumi e cenere, Gli Ori, Siena-Prato 2004; Flesh for Fantasy, Gli Ori, Prato 2004; Good Vibrations. Le arti visive e il Rock, Giunti, Firenze-Milano 2006; Numerica, Silvana Editoriale, Cinisello Balsamo 2007; Gordon Matta-Clark, Silvana Editoriale, Cinisello Balsamo 2008; Francesca Woodman, Silvana Editoriale, Cinisello Balsamo 2009; Pop Numbers, in Matematica e cultura 2010, (Venezia, Auditorium Santa Margherita, Università Ca’ Foscari, 27-29 marzo 2009), curated by Michele Emmer, Springer, Milano 2010, ; L’angelo sterminatore, in Enzo Gentile, Jimi santo subito! Il mito Hendrix attraverso immagini, parole e musica, Shake edizioni, Milano 2010. He is regular columnist for "GQ" and collaborates with the monthly magazines "Arte" and "Insound".